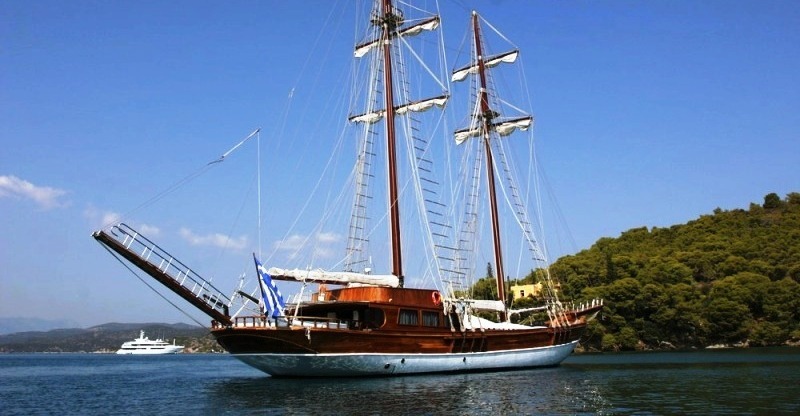 You'll enjoy a comfortable cruise in Greece aboard MATINA. Her broad beam means large decks and lots of space, and very smooth and stable sailing. From the first time you board MATINA you'll feel her immense beam. Her teak deck provides ample space for sunbathing and relaxing on large cushions. There's a panoramic view from the fly bridge and it's a favourite spot for keeping an eye on the action. You will be impressed by the large interior spaces, with the mahogany and warm colours making you feel quite at home. Built in 2000, MATINA had a complete refit in 2004. 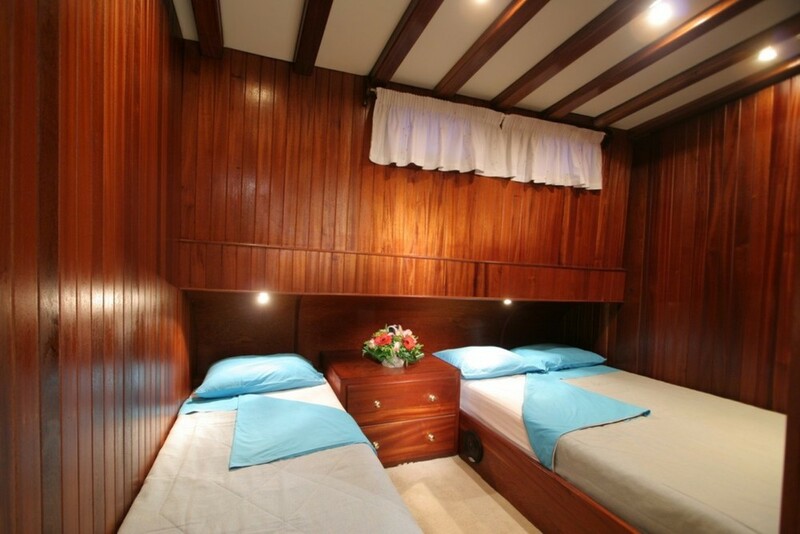 In 2008 her saloon was upgraded and her accommodation layout was reconstructed to include 8 cabins for up to 18 guests. 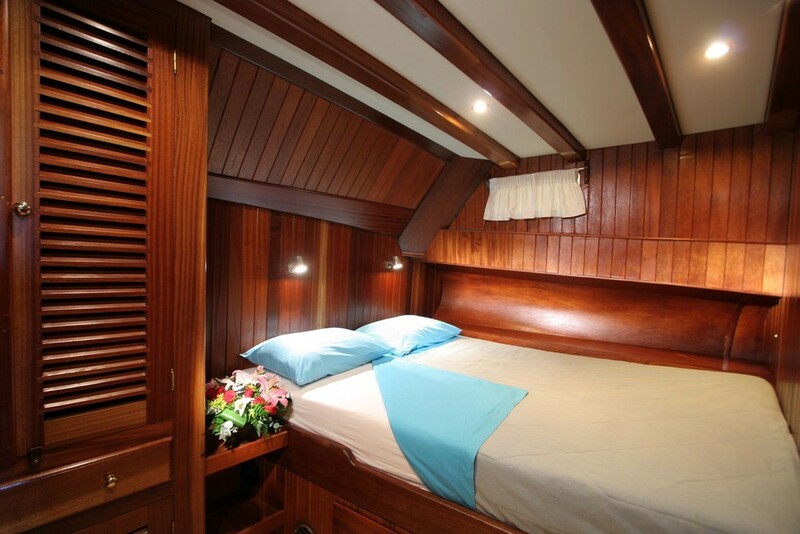 Very comfortable for living aboard, the eight luxury staterooms are beautifully finished throughout in rubbed effect mahogany. Each stateroom is fully air-conditioned, has a large private ensuite bathroom, radio/CD player, safebox and adequate drawer storage. MATINA'S professional crew will see that you are well cared for with their gracious hospitality and a desire to make your trip unforgettable. There is always something to do aboard MATINA in the Greek islands, from listening to her superb stereo, relaxing with a good book or enjoying some active time with a ski tube, water skiis and the water sports equipment. 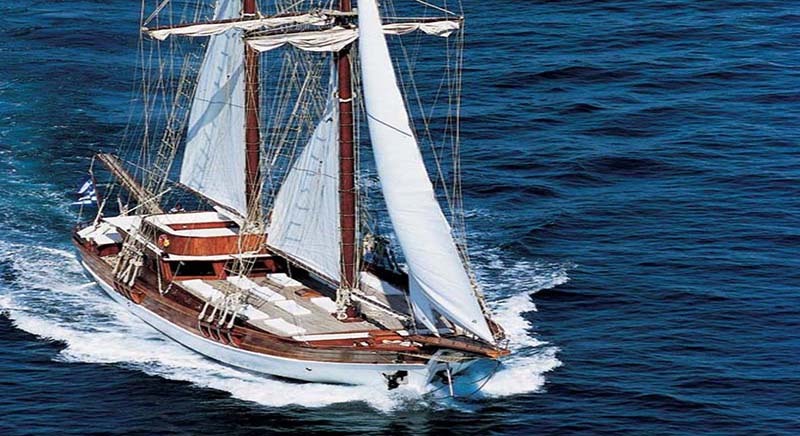 MATINA has the ability for some real sailing with a cruising speed of 11 Knots. Her 250 tons gives stability and security. With her sail area of 1.500 sq. meters, MATINA has an incredible sailing performance and is extremely stable with her wide beam of 9.40 meters. 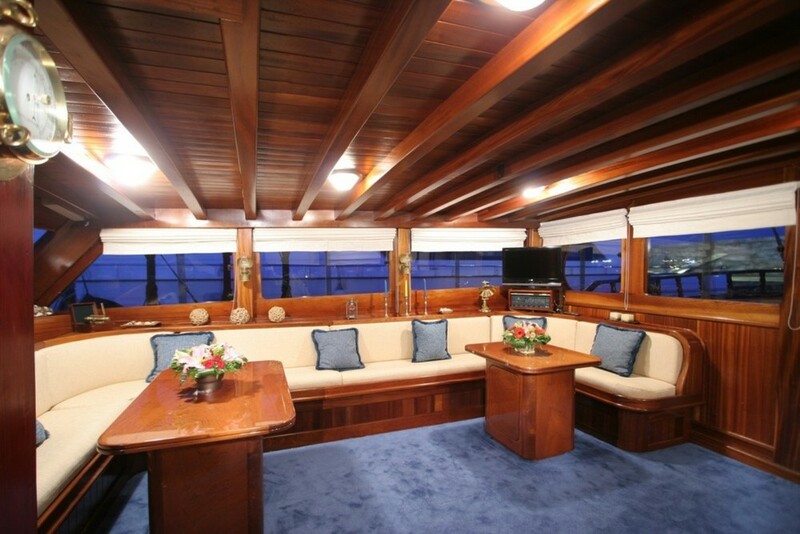 The main saloon adjacent to the galley area is of traditional design with rich mahogany paneling, where a group of 18 may dine in style around a teak dining table. 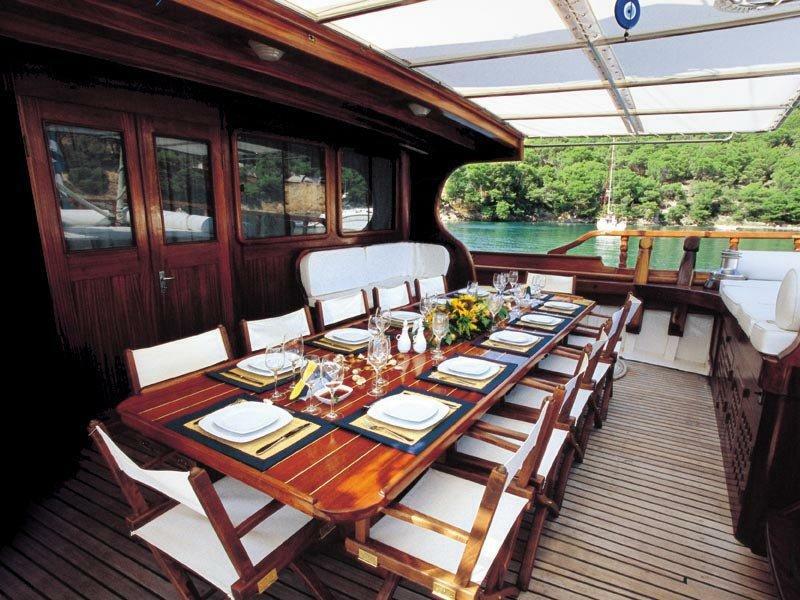 The main saloon leads on to the spacious aft deck with dining facilities around a teak table for 18. A further U shaped extremely spacious seating area on the Aft Deck is ideal for simply relaxing with a nice book, sunbathing or of cocktails. Each cabin, well ventilated with air-conditioning as well as opening portholes and hatches, has ample storage space and wide berths. Simple and tastefully decorated cabins all have en suite shower and WC facilities. 20 guests in 8 staterooms. All cabins are equipped with radio/CD player, TV, VCR, DVD, Camcorder, Stereo with CD player, cellular phone, Windsurf, 4.30 tender with 50Hp outboard engine, fishing gear, Jet Ski, water skiis, banana, snorkeling gear. Air conditioning throughout, safe box in all cabins, SAT MINI SYSTEM: Tel / Fax / Data / Internet, Bow Thruster, water maker, ice maker.